A thread looking at some of the 6 MHz beacons in Western USA. If you find these detailed reports useful or interesting, please feel free to reply with any comments. Starting with this post on the HexY2k ? dasher as it was seen and heard during mid-day local 1930 UTC 23AUG2018. Received on the coast of northern California. 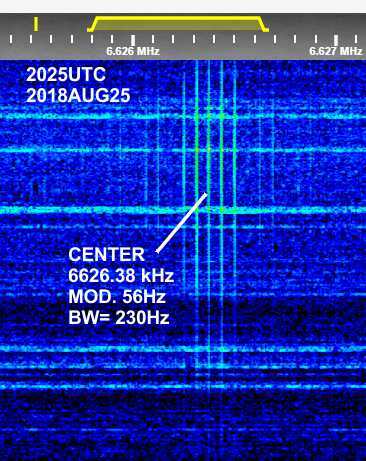 Below: Waterfall image at 1930 UTC 23AUG2018 of the HexY2k ? 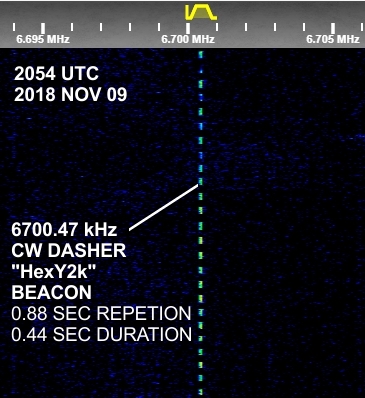 dasher beacon at 6700.51 kHz. 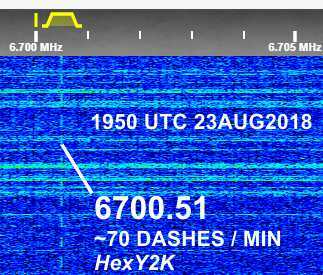 Western USA signals around 6626 kHz. Report 2023UTC 2018AUG25 mid-day local time. 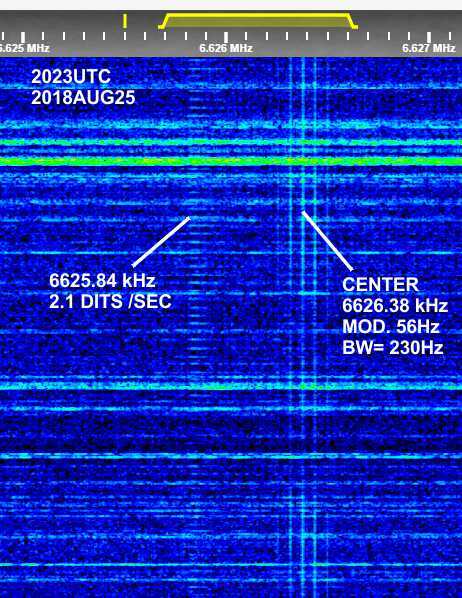 Below: Waterfall image of 6625.5 kHz USB at 2023UTC 2018AUG25 showing the dit and growl signals. Below: Waterfall image of the 6626.38 kHz signal, with better signal strength, at 2025UTC 2018AUG25. 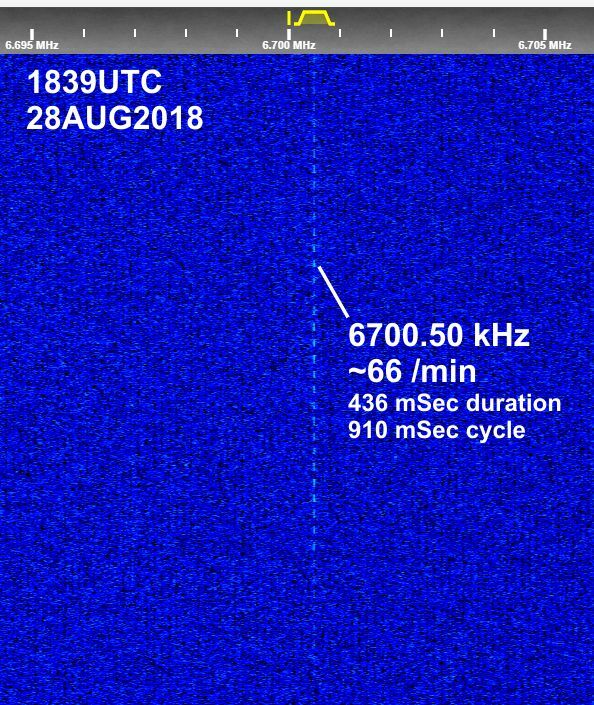 Note the absence of the ditter signal at 6625.84 kHz which had faded out during the time that this image was captured. The sidebands of the 56Hz amplitude modulation (AM) show up more clearly in this image. Approximate 230Hz bandwidth is due to the +/- 112Hz (2nd harmonic of the modulation frequency) . Other higher order harmonics of the modulation frequency extend upward and downward from the 6626.38 kHz center carrier. 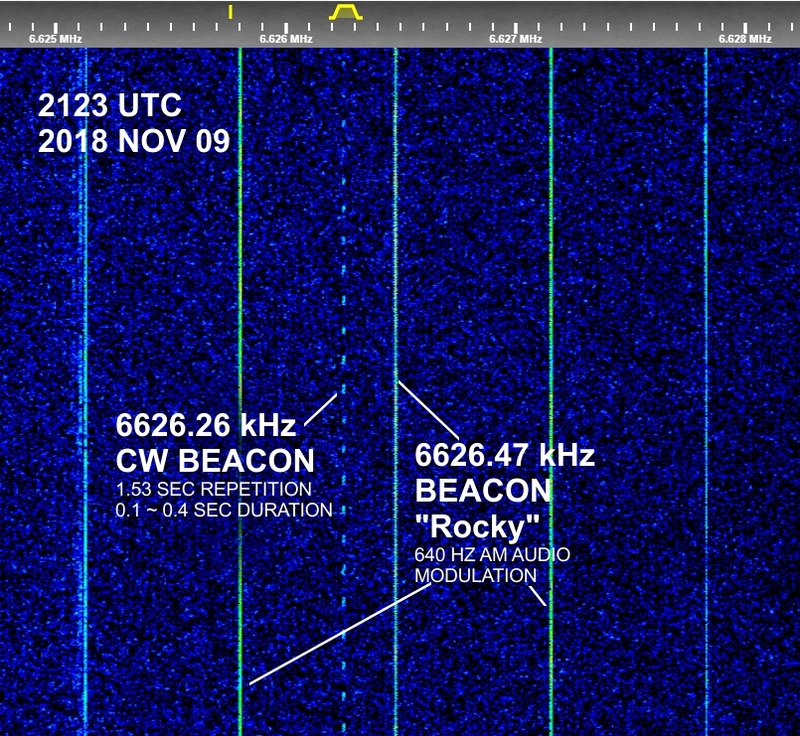 Highlight of this report: the "Rocky" buzzer beacon's audio modulation frequency is drifting, and the audio modulation frequency has changed since previous reports. The bandwidth is about 1 kHz. Local Pt. 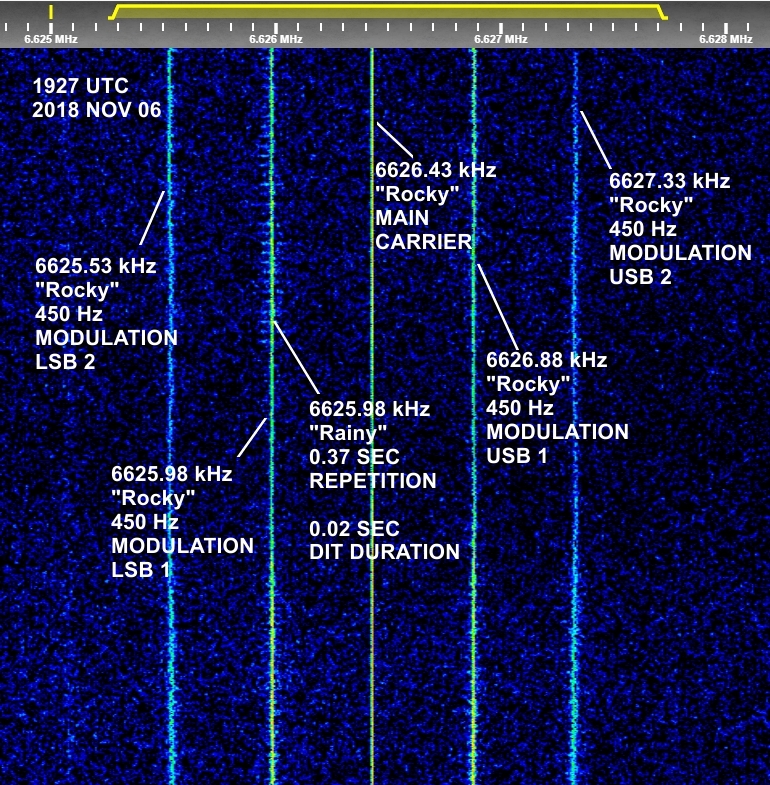 Arguello ionogram below, at 2100 UTC 2018 NOV 09, shows foF2 at 6.788 MHz. 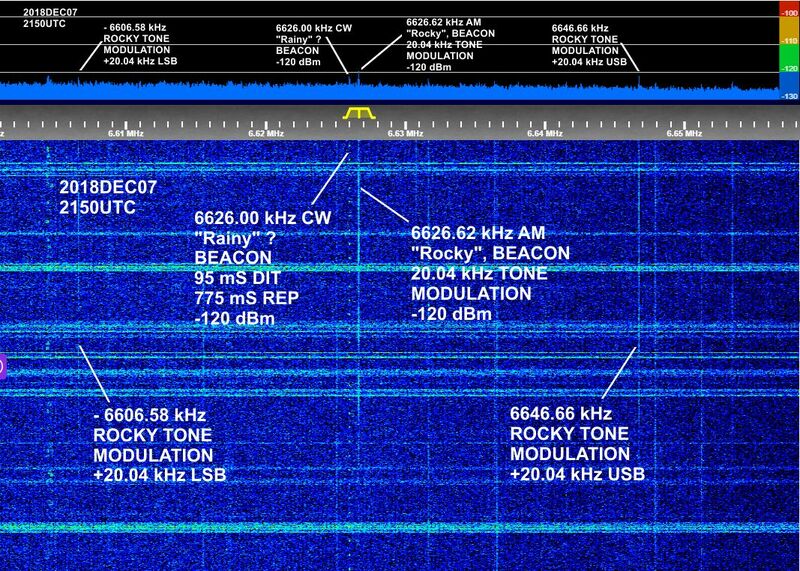 Note: this is not the normal repetition or duration recently logged for "Rainy" beacon, however it has been reported on approximately this frequency in the past. Note: usually, "Rainy" beacon is logged whenever "Rocky" beacon is logged, but the normal mode of "Rainy" is absent and not copied today in this logging. "Rainy" beacon is conspicuously absent. I do remember quite a few years ago hearing some of the west coast beacons like OR and S (which I think are gone now). Looking back at the old logs here, I was hearing the 4096 beacons back in 2009, and I think a few years after that, but no more. 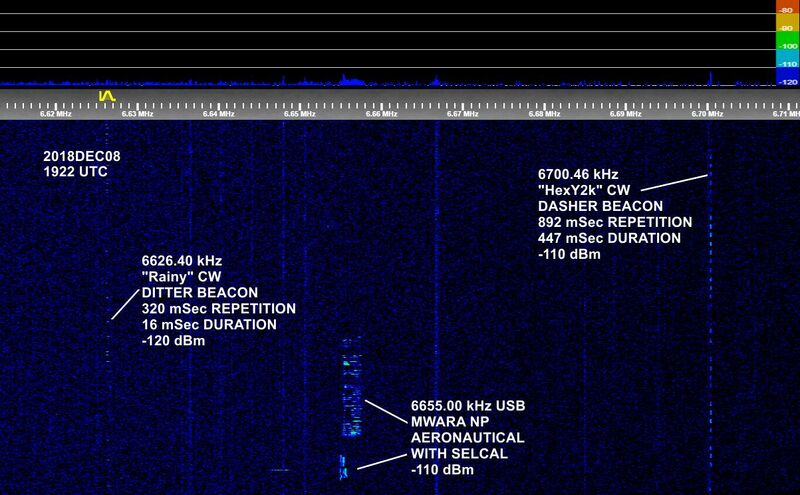 Looking back through the log I have seen several different beacons, or one beacon with large variations, around this freq. 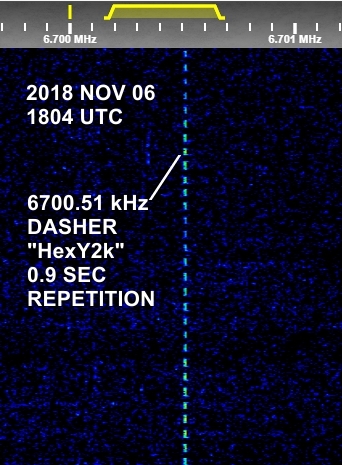 Going back to March of 2015 I have what I called a ditter (arbitrary name I assign to short duration pulsed beacons) in the log book on 6626.35 kHz. It was seen while both Rocky and Rainy were observed. At that time it had a 0.08 sec pulse every 0.67 sec. It looks like I have logged various pulse widths (up to 0.2 sec), rates (up to 1.5 sec), and freqs for what might be this same signal, I assume all the values are drifting over time and or temp. That is quite interesting, T! The old Rainy fast ditter 0.2 sec repetition rate characteristic signature has been totally missing from any of the recent observations here. At first glance, the UNID sure seemed like it could be Rainy, but the timing interval was quite different. If Rainy's dit repetition rate was slowed down just a bit, it might fit the pattern. Just a few weeks ago, Rainy was logged with a very regular 18.5:1 ratio (repetition:duration). The UNID has a much lower ratio, more of a dasher, than a ditter, with somewhat variable ratio, and less than 10:1. Hopefully, we can catch a glimpse again of both the UNID and Rainy at the same time. We are stumbling across a lot more of these weak signal mini-dashers out there in the 4 MHz ~ 14 MHz range. They certainly are not all wild beacons. Exactly what they are, remains a mystery. 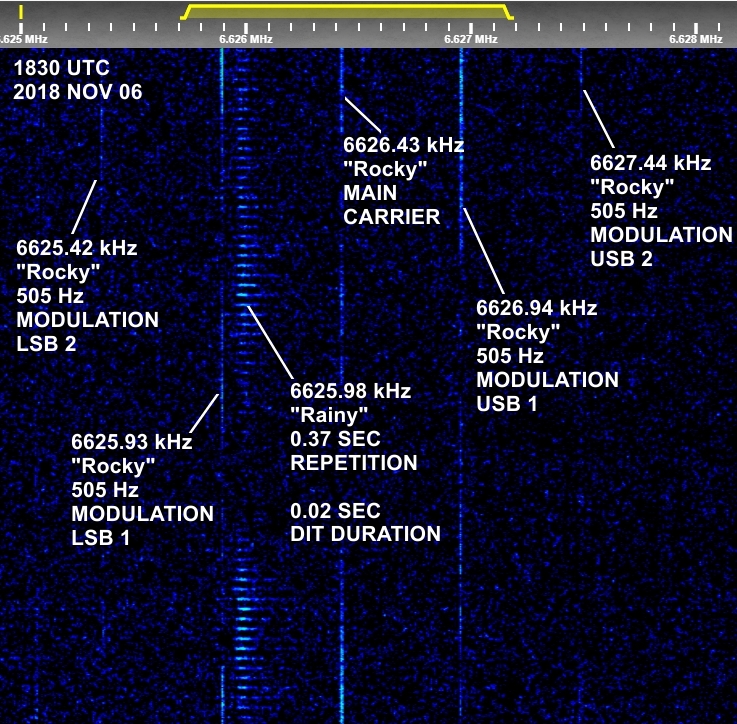 Report highlight: Rocky AM beacon has 3.19 kHz audio tone, highest logged so far. 6629 kHz, UNID signal, variable slow negative frequency change, slider, repetition 2 minutes, -115 dBm. Note: checked this UNID, it is not a local RFI signal, verified by copying it at the same time on a remote SDR in a different geographic area. Note: "Rainy" ditter beacon seems to be missing again today. 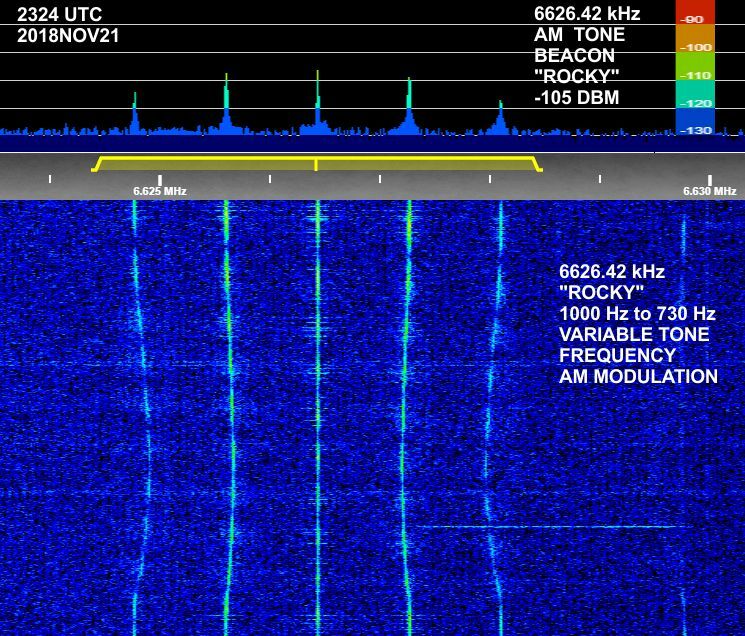 Note: The Rocky beacon audio tone modulation frequency appears to be increasing significantly as indicated by log reports. It has risen from 3.19 kHz to 20.04 kHz over the past week. 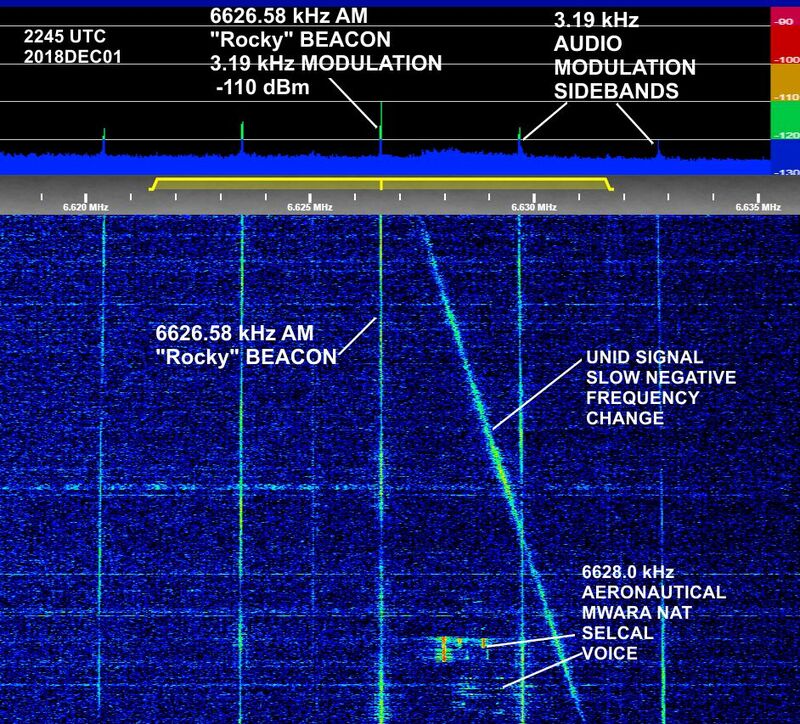 Highlight of this report: Rainy ditter beacon logged on 6626 kHz with good readability during mid-day. Waterfall image below shows Rainy ditter and HexY2k dasher with good readability.